A redesigned metastable phase of vanadium pentoxide (V2O5) shows extraordinary performance as a cathode material for magnesium batteries. The graphic compares the conventional (right) and metastable structures of V2O5. Credit: Justin Andrews. Dhaka, 6 Feb, Abnews: Move over, lithium-ion; now, there’s a better battery on the horizon. This rare phenomenon is achieved by limiting the location of the magnesium ions to relatively uncomfortable atomic positions by design, based on the way the vanadium pentoxide is made — a property known as metastability. This metastability helps prevent the magnesium ions from getting trapped within the material and promotes complete harvesting of their charge-storing capacity with negligible degradation of the material after many charge-recharge cycles. Banerjee, a Davidson Professor of Science in the Texas A&M Department of Chemistry and an affiliated faculty member in the Department of Materials Science and Engineering, has been working for a number of years to better understand ion intercalation — the critical process by which ions like lithium and magnesium move in and out of other materials within intercalation batteries. Using one of the world’s most powerful soft X-ray microscopes — the Scanning Transmission X-ray Microscope (STXM) and X-ray Emission beamlines — at the Canadian Light Source in tandem with one of the world’s highest resolution aberration-corrected transmission electron microscopes housed at the University of Illinois at Chicago (UIC), Banerjee and collaborators from the Lawrence Berkeley National Laboratory, the UIC and Argonne National Laboratory were able to observe the unique electronic properties of their novel vanadium pentoxide and directly prove magnesium-ion intercalation into the material. Collectively, the team applied decades of combined experience in materials science to explain the fundamental reasons why this new type of vanadium pentoxide is superior to the old version as well as to Li-ion batteries. Laptops and cell phones are two examples of the many technologies enabled by the rapid development of the lithium-ion battery, which revolutionized energy storage capacity and rechargeability in comparison to its lead-acid and nickel-metal hydride predecessors. However, given the widespread use of lithium not only in portable electronic devices but increasingly in the much larger batteries required for electric vehicles and grid energy storage, lithium is expected to be in increasingly short supply in the long-term. Furthermore, Li-ion batteries are a risky game, as highlighted by recent widely publicized reports detailed in Scientific American, Reuters and Forbes, for example, in which Li-ion-powered devices have either caught fire or exploded as a result of the fundamental flammability and reactivity of lithium. But for all their perceived advantages, magnesium batteries have proven too good to be true since they were first proposed in the 1990s and essentially sidelined by a variety of problems; primarily, the lack of a suitable cathode, or positive electrode — otherwise known as the part of a battery where the magnesium ions enter during discharge of the battery to power an electronic device and then exit during charging. In other words, Banerjee says, the magnesium ions get waylaid as they are traversing through the paths within the cathode material. Their sluggish movement is what makes it so difficult to make viable magnesium batteries. The team’s National Science Foundation-funded research features two additional current and former Texas A&M graduate students, Abhishek Parija and Peter M. Marley, respectively. David Prendergast, a Facility Director at Berkeley Lab’s Molecular Foundry, a U.S. Department of Energy National User Facility for Nanoscale Science Research, helped the Texas A&M team design and interpret their calculations, which were experimentally verified in part by Fakra using Berkeley Lab’s Advanced Light Source along with structural data collected at Argonne National Lab’s Advanced Photon Source. Atomic resolution images of the new form of vanadium pentoxide were collected in collaboration with UIC physicist Robert F. Klie and physics graduate student Arijita Mukherjee and show direct evidence of magnesium intercalated within the material. Battery measurements that show reversibility and confirm the robustness of the cathode material complete the story and were conducted in collaboration with Cabana and former Cabana group member Hyun Deog Yoo. 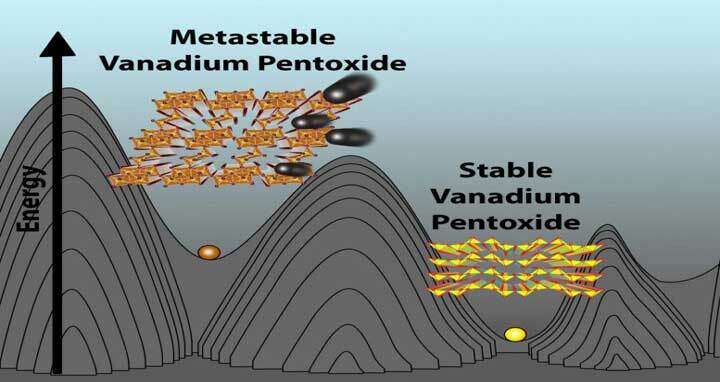 Andrews says the team’s research marks an important turning point in the field because it represents a significant advance toward solving the cathode problem while also highlighting the inherent advantages of using much more imaginative, metastable materials like this new form of vanadium pentoxide. But even he admits there’s much more work to do before this particular ’90s trend comes back in vogue.